On festive holidays when there’s a large party to feed, turkey usually comes to mind. For those of us who just can’t seem to conform to this tradition, a whole leg of lamb might be the perfect alternative. This simple German/Jewish recipe doesn’t take a lot of effort, makes a great impression and tastes fabulous. 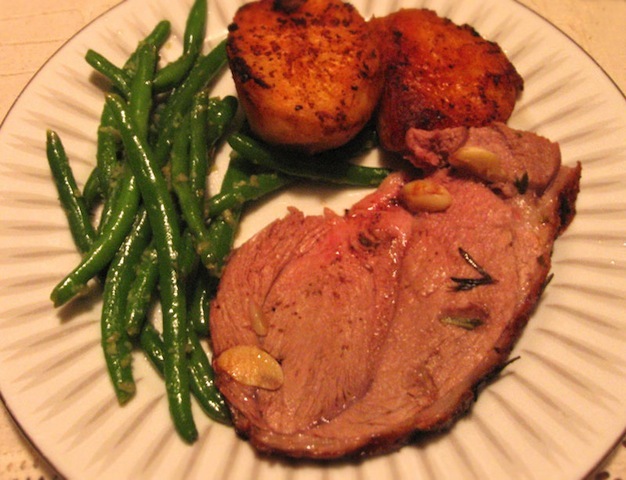 Round off the meal with roasted potatoes, garlic green beans and mint jelly, and you have a great main course. Serve shrimp cocktail for an appetizer and maybe some baklava from World Harvest or Euro-Mart for dessert. Now, you’re ready to make an unforgettable meal. You can order a leg of lamb from Schnucks or Old Time Meat & Deli ahead of time, and they’ll hold the meat for you (you can even specify your preferred weight). Recently, we invited our friend Rae over to show us how her family did this dish. Rae learned to cook from her mother, and this is a traditional recipe passed down for generations in her family. The secret is a lot of garlic and fresh rosemary – a heavenly combination. The idea of stuffing garlic into the lamb itself is brilliant. Making use of the lamb drippings to roast the potatoes adds another dimension to this side dish. We wanted something green on our plate, so we chose green beans for our vegetable side dish. Flavored only with garlic and salt, this dish is simplicity itself. Because we use garlic so much in our cooking, we wisely invested in a garlic press (available at Art Mart ). Now, whenever the recipe calls for minced garlic, we no longer have to peel the garlic. Crushing the garlic cloves through the garlic press is much easier and as a result, we now use more garlic. To do this dish right, you’ll need a roasting rack and a fairly good-sized roasting pan to catch the drippings. A meat thermometer will also help so that you can cook the lamb to just the right temperature. Using a sharp knife, poke holes into the lamb; then stuff one whole or one-half clove of garlic and as much rosemary as possible into each hole. Rub lamb with olive oil, then sprinkle with salt and pepper. Insert meat thermometer into the lamb. Put the lamb on a roasting rack so that the drippings can be caught in a roasting pan underneath. Roast in 450º oven for 20 minutes, then turn oven down to 350º and cook for about an hour, basting at least3 times. While the lamb is cooking, boil the potatoes in extremely salty water for about 10 minutes. Drain potatoes and transfer to a baking dish and dust with flour. About 15 minutes before the lamb is done, baste the potatoes with lamb drippings and put in oven. 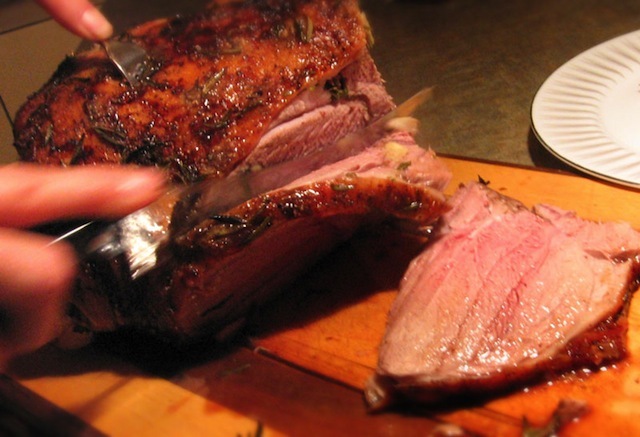 When the lamb is done (135º for rare, 160º for medium), remove from oven and let rest for 30 minutes before carving. 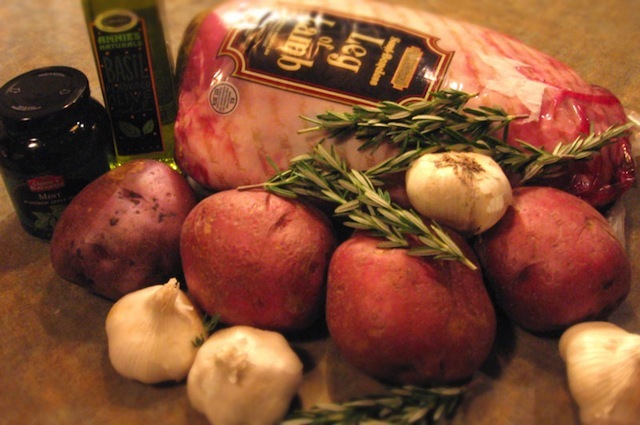 While the lamb is resting, turn oven back to 450º to brown the potatoes. Turn the potatoes after about 15 minutes. Sautee olive oil and garlic in a large sauce pan or wok. Add green beans, toss until green beans are coated with garlic. Toss again and cover for an other 5 minutes.